I was wondering if any other GMs keep track of their PC deaths. 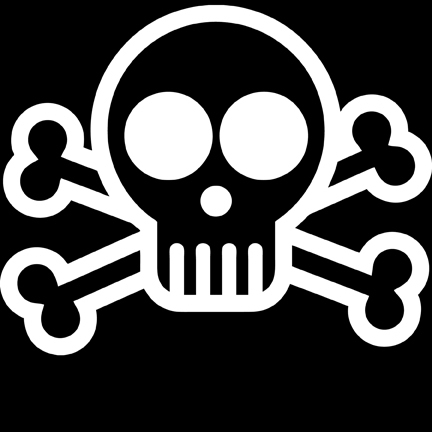 I've been using a barely modified version of Jolly Blackburn's skulls to keep track of my PC deaths, but I'm needing to expand past using that art. 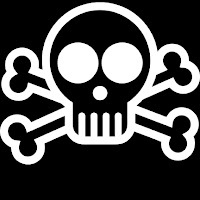 Don't get me wrong, I've liked the skulls he made, but I'm wanting to silk-screen some PC death skulls in order to make some patches to put on my Bag of Holding that my wife got me from Think Geek. In order to do the silk screening I needed different skull artwork that a) doesn't use someone else's IP and b) lent itself to the silk screen process. I found some open stock vector art that I was able to play with and I've laid out my basic required art for the silk-screen process. I won't be making the screens or the subsequent patches yet, but I wanted to get my work in order first. 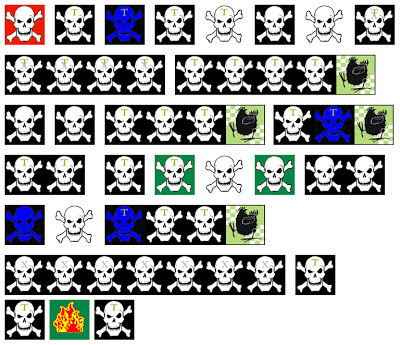 I've switched up one of the colors (swapped out black for grey) in order to make the skulls "pop" from the background, and I've changed the markings that denoted tournament deaths, TPK (total party kill), and TPKs at a tournament. I like the results. They may look a little more cartoonish, but there is a better consistency in style than what I had before and what I'm trying to accomplish. I also opted to get rid of an entry I at one point used to denote a PC that only survived by burning honor. Having a special icon to denote players "bravely running away" was enough. Each individual "skull" is the same size, but I changed up the orientation some to see how it would lay out in the space I have on my Bag of Holding. Skulls that are unmarked mean they were accumulated in a home game, "Tourny" means it was a tournament (or convention game), "TPK" means it was a Total Party Kill, and "TTPK" means it was a Total Party Kill at a tournament or convention game. Sir Robin's Chicken means the players decided to "run away". I only use that in a tournament or convention setting. 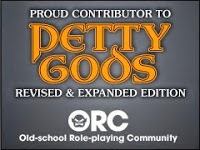 Home players running away aren't a big deal because they can regroup and come back later, but that usually isn't possible in a convention setting. The blue skulls simply mark if that character was somehow brought back to life. That will largely depend on your game system. The background color denotes how they died. Grey is for a monster death, red is Player vs. 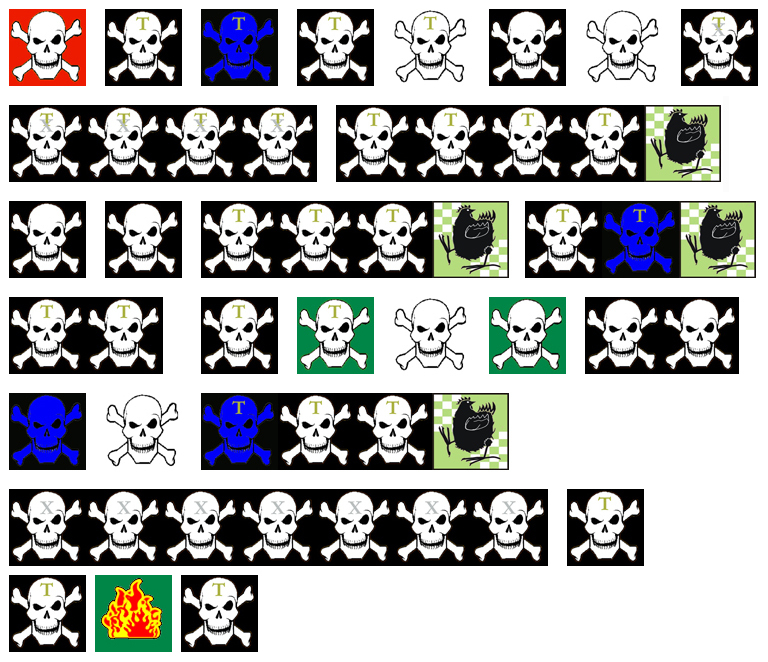 Player, green is for a trap, yellow (not shown) is a meta-death (in Hackmaster 4th Edition that would be due to a coupon). I would use yellow in my current game if somehow the PC was taken away in-game (like slavery). White is a miscellaneous marker. Perhaps the player just did something really stupid and killed themselves. I've used it for non-trap poison or magical death. A PC fire-balling itself would get a white background.